When I got my first motorcycle, though, I quickly changed my tune. Yes, when I found out DIY motorcycle mods would be putting money back in my wallet, we were both overjoyed (my wallet and I were, that is). At first, I envied other riders and their custom motorcycles, each glistening with custom touches and motorcycle mods I was assured would increase a motorcycle’s performance. So, I started asking around, wondering where they’d gone to get these motorcycle modifications installed, and praying the cost wouldn’t be too steep. They told me they’d installed these things on their own. Turns out, these cheap motorcycle mods to boost performance were just as effective as the ones a career mechanic would install. Thinking you might want to increase your motorcycle’s power or boost your motorcycle’s performance? There are easy DIY motorcycle mods just waiting to be installed on your bike. 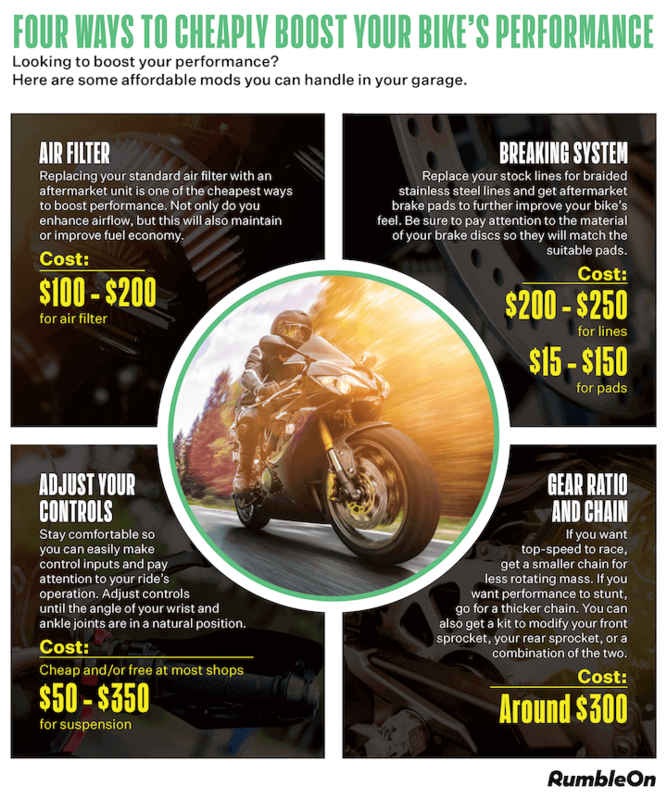 Take a look at the infographic below for four totally tackle-able DIY motorcycle mods to boost performance that won’t break the bank. On Mobile? Tap the infographic to enlarge!